Given the depth of the Great Recession’s impact on the housing industry, most insiders are hoping for that long-awaited economic rebound which will finally provide some solid flooring to our decimated industry. And some may get their wish, although the recovery will be uneven, slow and prone to a variety of unknown risks which accompany any forecast. Since most of the economic growth noted in the third quarter of 2009 was due to fiscal stimuli such as the homebuyer tax credit and Cash for Clunkers programs, it still remains to be seen if the economy can rebound without any government training wheels. In their latest economic forecasts, our partners at Beacon Economics are calling for growth in U.S. GDP of about 2% in 2010, fueled mostly by increased business investments related to higher savings rates, and a closing trade gap. Yet as tax cuts from the Bush years begin to expire in late 2010 and early 2011, if there is not a double-dip recession, 2011 could see a slow growth rate close to 0%. Thankfully, it seems that unemployment levels may have peaked at around 10% and will gradually decline to 5.5% by 2013. One wild card which remains is that of ‘shadow inventory’: with 1.7 million homes scheduled for potential sale due to defaults and foreclosures at the end of September 2009 – up by 55% over the past year – any housing recovery will remain in limbo until the supply of discounted foreclosures is largely exhausted. Still, there is a significant silver lining to declining prices, which is that of sharply rising national affordability levels, which have recently been averaging close to or over 70%. Since cheaper home prices and falling rents mean greater mobility, candidates for jobs will find it much easier to relocate than would have been possible during the height of the boom years. In practical terms, what that means is that banks will avoid taking back commercial properties until the one-two punch of rising vacancy rates and falling rents forces property owners into default on current loans. For cash-rich investors with the fortitude to wait and conduct appropriate due diligence, however, 2010 could bring some of the best opportunities in years. Another wild card is that of the huge surplus of cash – about $1 trillion – sloshing around in the reserve accounts of the nation’s banks and originally employed to avoid financial Armageddon. Assuming the Federal Reserve can stomach higher interest rates and a stronger economy can mop up this extra liquidity, inflation can be held in check, but it will require a careful balancing act in a highly politicized time in which there are no good guides to follow. Finally, there are always a series of economic risks which could upset most forecast scenarios, which include a lack of private sector buyers of mortgage-backed securities after the federal government steps back from the market, a weakening dollar leading to a trade war, a rising federal debt, higher tax rates, a bear market for Treasury bonds, persistent high unemployment, geopolitical conflict and a foreign government defaulting on its debt. In other words, the usual suspects. But fear not. When the impacts from the Great Recession are over, the U.S. will emerge stronger, healthier and with a more stable economy yielding realistic asset prices. Consumers will save more, leading to more balanced trade and a return to steady growth of about 3% per year. And ultimately, the nation’s quality of life will remain one of the best in the world. My column for the December issue of Builder & Developer magazine is now online. Over the past 30+ years, most of the new homebuilding activity was to follow the demands and tastes of the 78-million-strong Baby Boomer generation, from starter homes and move-up housing to vacation homes, retirement communities and even condominiums in urban locations. But according to a series of presentations at the ULI Fall Conference & Urban Expo last month in San Francisco, demographic changes in the U.S. will force many builders and developers to change how they build for a population that is getting increasingly grayer (older) and browner (more diversified). Click here for entire column. Having covered Las Vegas as a consultant (and for a homebuilder) over the last 15 years, I've gotten to know the city -- and The Strip -- pretty well, and made it a point to visit and stay at various resorts whenever I visited. One thing that always struck me as curious was the unbridled optimism behind the massive projects which continuously seemed to spring up, as if the "If you build it, they will come" mantra could just live on forever even as growth in visitor traffic began to slow. Back in late 2006, when a friend had considered buying a high-rise condo in Vegas, I begged him not to, as I could see the crash that was about to come in the not-too-distant future. 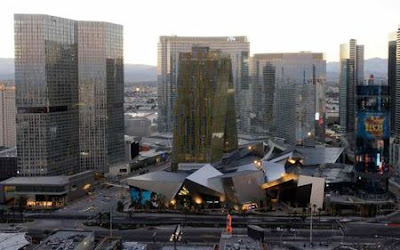 Now, as Vegas remains mired in one of the weakest economic environments over the last century, the $8.5 billion CityCenter project -- the largest private development ever built -- is set to open. In their defense, of course, these projects are planned far in advance of economic swings, so it's not like they planned to open at a time of 10% national unemployment, a more guarded consumer spending less on travel on airlines cutting back on flights. But they did nonetheless. With that said, I can't wait to see this project in person, but until you can they've developed a very expensive Web site that will help you tour the entire 67 acres, with links to the Web sites for each individual hotel, condo project and mall property. What will be most interesting it to see how the non-gaming hotels -- of which there are three -- will fare, given that gambling revenues remain an important way to hotel companies to make cash. Will the receipts from hotel room, dining and spa services and retail stores be enough to make this a go in the long run? Only time will tell. In the meantime, L.A. Times architecture critic Christopher Hawthorne summarizes his findings after a personal tour. Could housing come back with a vengeance? Tighter lending. More foreclosures. Falling prices in some markets, while others stabilize. None of these trends should come as a surprise, but FrontDoor.com has rounded them all up in a single article. So what are they? For more details on each of these trends -- or the entire article -- click here. … demographic changes in the U.S. will force many builders and developers to change how they build for a population that is getting increasingly grayer (older) and browner (more diversified). Many thanks to the "River Banks to Cornfields" blog for citing the post! 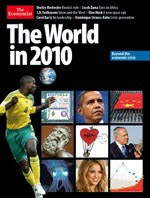 The Economist presents "The World in 2010"
Each year, The Economist magazine publishes "The World in" annual book of predictions, and the 2010 version is now available online. The good news about 2010 is that the world will emerge from recession and the post-crisis economic landscape will become clearer. Less cheerful is what that landscape will look like. For a summary of links to the various stories in this publication, click here. LA Land has moved to a bigger, brighter, newer home. You can now find it in our Money & Company blog. You will still be able to find all the real estate news, foreclosures, and Hot Property pieces, but now in our uber-business blog. He wants to make those and other changes because a recent audit has shown that the FHA's reserves have fallen below mandated levels as the agency has become a larger part of the housing market. The percentage of mortgages insured by the FHA has soared from 6% in 2007 to almost 30% this year. The FHA insures mortgages made with as little as 3.5% for a down payment and has become vital in a housing market where credit remains tight and borrowers' bank accounts have been depleted by the financial crisis. The future of new housing is -- foggy? It seems that one of the most important lessons that the country’s builders learned from the past downturns was to immediately react when the market turned with generous incentives, price cuts and, over time, a dramatically scaled-down industry with simplified product lines that are now affordable to almost 60% of potential buyers. As of September 2009, this slash-and-burn strategy has sent new home inventory down to its lowest level in 14 years, which would sell in just 7.5 months. And in spite of brutal competition from the existing home market – in which 30% of sales are for distressed properties – new home prices seem to have stabilized at just under $205,000, although that could be the result of buyers taking advantage of tax credits that were recently extended until April of 2010. Since the U.S. population and related demand for housing continues to increase no matter the economic climate, when the economy improves and people decide they no longer want to live with roommates or their parents, it is clear that a dormant industry will be revived, as we’ll need 1.3 million housing units each year just to keep up. What’s not so clear is how fast this rebound will occur and, more importantly, how future new home communities will be shaped, marketed and sold. In addition, the 70-million-strong Generation Y, having largely grown up in quiet suburbs requiring cars to run simple errands, have morphed into a gadget-obsessed cohort whose penchant for urban-oriented, walkable communities and cynicism for traditional marketing techniques will require an entirely new skill set from an industry that has long relied on precedent in the hopes that each new rebound will be much like the last. For one thing, according to Reach Advisors, overly rosy demographic projections of the past were used to justify multiple years of over-supply for empty-nester projects in urban areas (especially high-rise condos), vacation homes and traditional retirement communities at a time when many Baby Boomers prefer to age in place. Moreover, even if they want to trade down to a smaller home in an active adult community, today’s over-55 homeowners are sitting on a huge supply of large homes in suburban areas against a backdrop of potential buyers that’s not just smaller, but less interested in this type of car-centric community. When many Gen-X buyers do trade up, they’re placing an economic priority on community characteristics (such as a mix of uses and population and access to transit options) rather than a large home with a premium lot. But it’s really the Generation Y cohort – with three times the population of Generation X -- that will foster in the biggest changes to the building industry as these ‘echo boomers’ began to enter the workforce, create their own households and bring their own, separate demands to builders of homes and apartments. For one thing, the gender gap that existed just a generation ago – in which men earned more college degrees and more money for the same job – has almost completed a polar shift, giving many women control of the household finances and home-buying decisions. In addition, accompanying more education for Gen-Y households has been a delay in marriage and having children, thus changing both the timing and type of demand for housing needs. Most importantly, however, with today’s Gen Y woman being more fiscally conservative than her male counterpart, builders will have to change how they merchandise and model their product to appeal to this new reality. Fortunately, there’s another reality that will allow the industry to adapt to these echo boomers: this shift will not be seen in weeks or months, but years and even decades. According to the latest data from Hanley Wood (and included in my presentation at the BIS '09 "Town Square", which you can find here), new home sales in Orange County in Sep. 2009 were the same as in 2008, which could mean that we've hit bottom in new home sales for this area. Still, YTD sales are down by 23% to 1,242 units. Absorption, although averaging a still-anemic 1.42 sales per month, are up by 37% over Sep. of 2008, and YTD they're running at 1.63 per project. Can rates remain in the low double digits, and median prices are starting to rebound, hitting $584,000 for September and $521,000 for 2009 YTD. Value ratios, however, continue to fall, declining by 6.5% to $276 per square foot. Looking ahead to 2010, population growth should come in at 0.9%, with the unemployment rate continued to rise to nearly 10% as employers continue to shed jobs. Still, the decline in non-farm employment of 2% will be less than half of what it's expected to total in 2009, or -4.8%. According to the latest data from Hanley Wood (and included in my presentation at the BIS '09 "Town Square", which you can find here), new home sales in the L.A/Ventura region are definitely seeming to stabilize, rising by 1.3% between Jan-Sep 2008 and the same period of 2009. For September alone, net sales rose by nearly 19% over the same time of 2008, although that bump could also be due to buyers trying to nab tax credits they thought were expiring at the end of November. Buyers today are also more serious, as evidenced by the sharp drop in cancellation rates to the low double digits versus 26% in Sep. of 2008 and just 9% for the first 9 months of 2009. Overall new home prices continue to drop, with a median of $421,000 in Sep. 2009, or $332 per square foot. For single-family homes alone, however, prices actually rose by 15% to $614,000 during Sept. 2009, although YTD they're still down by nearly 11% to the low $400,000s. Although total new home inventory -- those units currently available for sale as well as those planned in future phases -- would still take 3 years to absorb at current sales rates, completed inventory, although rising by 18% over the past year, stands at just 6.51 months, which is very close to market equilibrium. Looking ahead to 2010 and according to the LAEDC, although population in L.A. County will continue to increase given its enormous base, the employment picture is a bit different. During 2009 the county will lose 4.1% of its non-farm jobs base, and although the pain will continue in 2010, it will be half as bad, or 2.0%. This, of course, will continue to be a drag on housing demand until at least 2012 as the unemployment rate rises to approach 13% in 2010. Inflation, which is now under control due to temporary deflationary influences in the marketplace, will re-emerge to 1.6% in 2010 but certainly be kept under control by stagnant demand for all but the necessities of life. Housing permits are estimated to total 6,465 units in 2009 and rise slightly to 6,855 in 2010, but the commercial sector will be under great pressure, with non-residential permits falling below $2.4 billion. According to projections I just completed for Hanley Wood's latest LA/Ventura Market Monitor, annual new home sales will total 4,000 units in 2009 and rise by about 15% in 2010 to 4,500 homes. Prices, which seem to have bottomed out this year, will end at $420,000 and rise by 5% next year to $440,000. See table below for summaries on these forecasts, and for the complete presentation, click here.